In this subproject, we empirically and experimentally analyze customer reviews and certifications as instruments to reduce information asymmetries in electronic markets for composed services. As still-to-be-developed OTF markets are a specific type of electronic markets, reducing information asymmetries in these OTF markets is essential to prevent the market from failing (in the sense of a "market for lemons"). Whereas the source of the reputation differs, both instruments - customer reviews and certifications - can be described as contributions to reputation formation. When examining the suitability of these instruments to reduce information asymmetries, we consider the influence of specific OTF market characteristics, particularly in light of the possible consequences of opportunistic behavior. The methods we apply in this subproject involve empirical studies using self-collected data from already existing electronic markets, which have one or more characteristics that are similar to the OTF market to be developed in the project. We will also conduct laboratory experiments in the Paderborn BaER-Lab, the Business and Economic Research Laboratory, to examine the issues to be answered in the subproject. Analyze causal effects of customer reviews and certifications on service quality. Investigate opportunities and limits of customer reviews and certifications that help to reduce information asymmetries in OTF markets. Design and evaluate different manifestations of customer review systems and certifications that reduce information asymmetries in OTF markets. Specifically, the subproject is organized into the following areas. In this area, we investigate the influence of different combinations of the descriptiveness of services as well as the credibility of the service descriptions on the impact on instruments that foster the (gradual) emergence of reputation. We econometrically analyze the influence of market characteristics on distributional properties of customer reviews of services, using real-world data. As market characteristics can have a substantial influence on the customer reviews of a service, market characteristics have to be taken into account when interpreting the customer review score of a particular service. 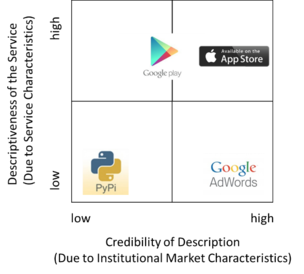 This is likely to be important when comparing service qualities from markets with different characteristics. In this area, we focus on the influence of fraudulent customer reviews on the efficiency of instruments that are designed to reduce information asymmetries in electronic markets. Investigating the influence of opportunistic behavior of OTF market agents on the efficacy of customer reviews as an instrument to reduce information asymmetries. Examining two forms of opportunistic behavior: Fraudulent customer reviews and changing the identity of providers with negative customer reviews. Designing and evaluating measures to prevent opportunistic behavior in OTF markets. We investigate the sellers’ usage of reputation systems, whereby it is part of the design that sellers can use a positive reputation to increase short-term revenues by selling low-quality products and, as a consequence, receiving negative customer ratings which, in turn, leads to a decrease in the relevant reputation score. Experimental evidence suggests that individuals do in fact exhibit a tendency towards this behavioral pattern. Customer reviews describe the experience with composed services. The first challenge is to disaggregate these composed service reviews to assessments of single services supplied by service providers. To approach this challenge, we empirically investigate already existing review platforms, on which composed services are assessed. Furthermore, we plan to analyze specific multidimensional customer review systems in electronic markets concerning their suitability to provide for the quality of the composition of OTF services. The aim is to shed light on an individual’s aggregation heuristics applied when giving customer reviews to a composed service. This knowledge can, in turn, be applied when aggregating the customer reviews of single services into a service composition on the OTF market.